The portable toilet outside the First Christian Church in downtown Albany on March 23. City officials insist the municipal code forbids “privies” not connected to the sewer system, but the code itself says the council can allow them for up to a year, and the council can also grant further one-year extensions. 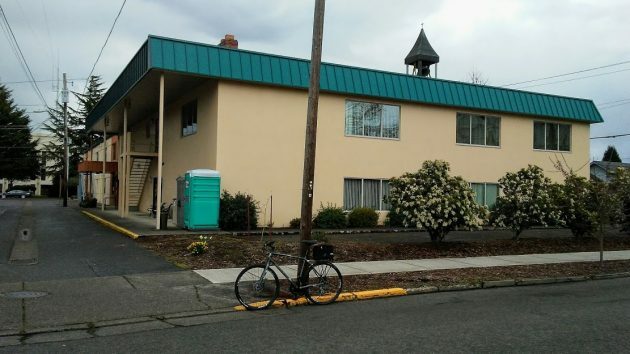 Last fall, the First Christian and the United Presbyterian Church went together on the expense of having the outhouse set up in response to First Christian’s preschool staff noticing human waste on the grounds. Police saw the toilet some time later, and the churches then asked for city permission, which was denied. On Monday, represented by Daniel Dietz of First Christian, the churches asked that the code be changed to establish objective criteria for granting or denying privy permits. Mayor Sharon Konopa said allowing portable toilets on private property would open “Pandora’s box.” She is worried that allowing one would lead to many others, and this would undercut efforts to combat homelessness. If people are homeless, she believes, they should spend nights in homeless shelters, where they have access to showers and toilets, and not hang around downtown where there are no facilities. Konopa expects the staff report she asked for to be ready in time for the council meeting on April 24. I didn’t get an answer — none that I understood anyway — to this question : If the city code has a blanket prohibition of permanent privies without express council action once a year, what’s the legal status of portable toilets as permanent installations in several city parks? San Fransisco, Seattle,……………Albany? Hope not! Even Pandora had to use the bathroom from time to time. This City’s brutally cruel attitude towards the homeless is reminiscent of our current Department of Homeland Security. One might think Stephen Miller is whispering in the Mayor’s ear. If there is a need, then it should be allowed! The needs of the community are more important than a code. Obviously, we would love to know that all the homeless in our community are safe, warm and fed but its not our reality. If the portable bathroom is serviced regularly and meets a need in our community then allow it to remain. This is a tough issue. After seeing the new video, coming out of Seattle, I have to say this is not the path you want to go down. It’s scary to see the destruction to that community, it’s a warning to other communities. There has to be a balance between personal freedom and your responsibility in a community. You have the freedom not to go to a shelter but you don’t have the freedom to harm the community in the process. I agree. IMO, it’s about boundaries: what they are, why they are, who makes them, and how are they enforced. Nothing is black and/or white. The writer is correct. Immediately upon learning that Albany has authorized the location of a porta-pottie, every homeless person between Seattle and San Francisco will scurry to Our Fair City. Perhaps the Albany City Guard could string concertina wire around City limits. The welcoming sign (just inside the wire) would read: Welcome to Albany, Effluent-Free Tree City since 1969. You want then invite them to your house or make an endowment to the city for their care and feeding (Are you George Soros?) No they’re not gonna suddenly uproot from Seattle to flock here. That’s not how it starts and you know this. A community builds as word goes out and awareness off facilities that allows them to use drugs and not check into a shelter where they’re required to be clean and sober. Portland-Seattle-SF do not have a homeless problem they have a drug addict problem that they helped to create! It’s wonderful that you have the moral high ground but touchy feely virtue signalling will be the death of our cities if we continue down this path. The VA calls alcoholism “Willful Misconduct” because if they had to baby sit every alchy it would bankrupt the VA and they wouldn’t be able to provide services for the rest…Pragmatic is what it’s called. Hard times creates strong men-Strong men create good times-Good times create weak men-Weak men create hard times…Maybe it’s just got to be hard times for a while. maybe we’ll get strong or …we’ll dissapear. It’s just nature for what it is! The City finally gets to deal with an issue that’s closer to their skill set.